This stock video features an aerial shot of a shoreline with cliffs and rocks during sunset. The sky and waters are still dark as the sun is about to rise. 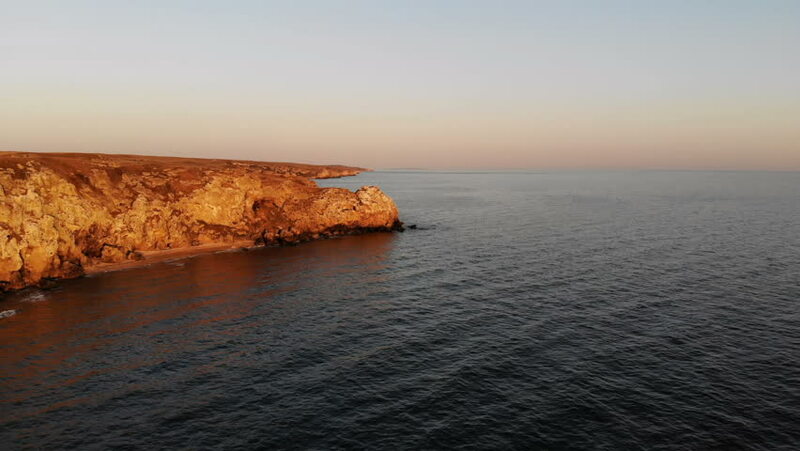 hd00:28This stock video features the aerial shot of flying over the sea, presenting the beautiful contrast of the coastline's blue water and the golden geo land formations. 4k00:09The Pacific Ocean at Santa Cruz, Steamer Lane West Side, California, USA, circa October 2018. Steamer Lane is a famous surfing location in Santa Cruz, California. hd00:08Slowdown aerial shot of the water by the cliff. Ocean. Quy Nhon, Vietnam. 4k00:27Aerial Drone small island on river and lake on autumn in golden hour.Kiev sea river island aerial drone fotage. The camera flies around the small round island. drone footage aerial view from above. 4k00:23red sunset over the Mediterranean sea. flight.